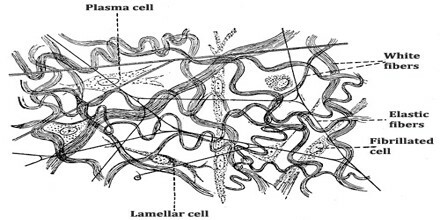 Elastic fibers are generally 0.2-2 mcm in diameter but may be larger in some ligaments; they branch and anastomose to form networks and fuse to form fenestrated membranes and elastic laminae; the fibers and membranes consist of microfibrils about 10 nm wide and an amorphous substance containing elastin. Elastic tissue is classified as “connective tissue proper”. Unlike collagenous fibres, they show no orderly fibrous subunits under microscopic examination but sometimes appear to be composed of minute fibrils around a solid core. Elastic fibres are not broken down by hot water, as are collagenous fibres; and they are resistant to most enzymes. As is suggested by their name, the fibres are highly elastic and impart elasticity to structures such as the skin, the lungs, and some large blood vessels, such as the aorta. Elastic Fiber is formed from the elastic microfibril, consisting of numerous proteins such as microfibrillar-associated glycoproteins, fibrillin, fibullin, and the elastin receptor and amorphous elastin. The permanganate-bisulfite-toluidine blue reaction is a highly selective and sensitive method for demonstrating elastic fibers under polarizing optics. The induced birefringence demonstrates the highly ordered molecular structure of the elastin molecules in the elastic fiber. This is not readily apparent under normal optics. 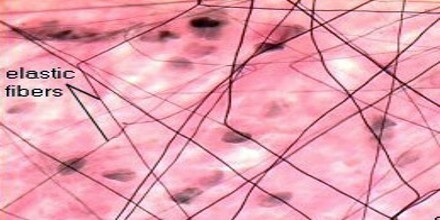 Elastic fibers are absent from scarring, keloids and dermatofibromas and they are decreased greatly, or are absent in anetodermas. Microfibrils are a major component of connective tissues, and are localized either freely in the tissue space or in association with elastic fibers. Microfibrils are formed by varieties of components depending on their functional and structural requirements. They include several proteoglycans such as chondroitin sulfate proteoglycan (CSPG), heparan sulfate proteoglycan (HSPG) and versican. 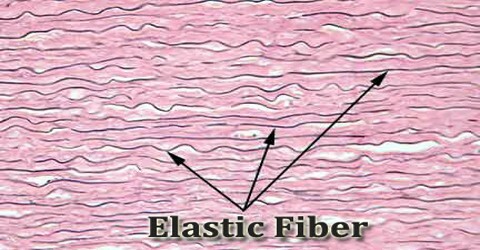 Elastic fibers are actually found in the skin, lungs, arteries, veins, connective tissue proper, elastic cartilage, periodontal ligament, fetal tissue and other structures. Elastic fibers were found to contain two distinct morphologic components in sections stained with uranyl acetate and lead. These components are 100 A fibrils and a central, almost amorphous nonstaining area. During development, the first identifiable elastic fibers are composed of aggregates of fine fibrils approximately 100 A in diameter. Specific staining characteristics for each of the two components of the elastic fiber as well as for the collagen fibrils in these tissues can be demonstrated after staining with lead, uranyl acetate, or phosphotungstic acid. The significance and possible nature of the two morphologic components of the elastic fiber remain to be elucidated. Reference: thefreedictionary.com, britannica.com, ncbi.nlm.nih.gov, wikipedia.